LIVE FROM DUBLIN is a reverential, yet riotous, memorial to Derek Bell, the Belfast-born multi-instrumentalist. Bell was an invaluable member of the Chieftains, and his sudden passing in 2002 marked the end of an era. The Chieftains' playing overflows with inspiration on this outing. Bell's lively piano solos and virtuosic harp accompaniments are sadly missing, but Paddy Moloney and the gang does much to compensate for this. Joined by a diverse group of guest artists, including vocalists, string players, pipers, and former band members, the world's most celebrated traditional Irish ensemble does an exceptional job of remembering their friend and colleague. Whether it's the raucous opening medley, the bluegrass-influenced "Down the Old Plank Road," the reflective medley featuring "Derek's Tune," or the rowdy vocal number "I'll Tell Me Ma," this album mesmerizes from start to finish. Not only does this concert benefit from fantastic musicianship, its varied repertoire and colorful programming also add to the excitement. This all culminates with the explosive "Finale," which is a cornucopia of reels, jigs, American country, and gypsy jazz. 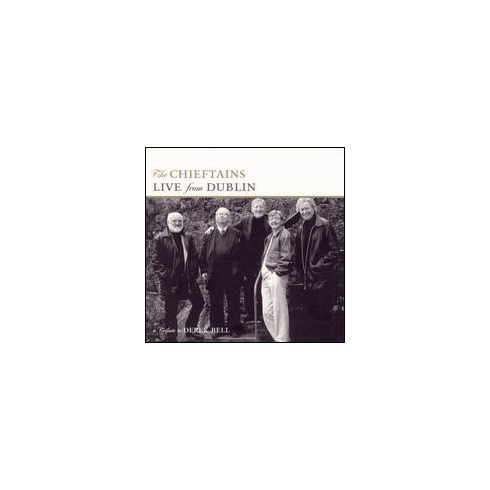 LIVE FROM DUBLIN is a very touching tribute to one of Ireland's finest musicians.